Cravings for authentic Chicago-style pizza in Palo Alto can be easily met by Pizz’a Chicago with a long menu of creative gourmet pizzas and options for your own concoctions. But there is much more to enjoy—including delectable pasta when you just aren’t quite in the mood for pizza. Pizz’a Chicago does not serve pasta dishes with modest portions, so you will definitely leave satisfied after sinking your teeth into stacked homemade lasagna with ground beef and sausage. For another classic choice, you might go with spaghetti and meatballs or ravioli stuffed with beef or cheese. Not in the mood for red sauce? 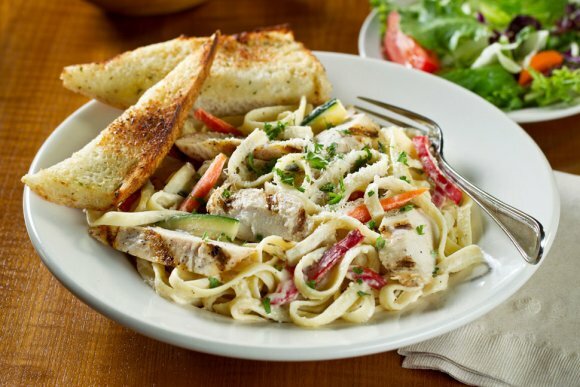 Pizz’a Chicago has you covered with a mouthwatering Fettuccine chicken Alfredo dressed up with carrots, zucchini, and red bell peppers. Sandwiches, fresh salads, and calzones can also fill you up when pizza is not exactly what you are craving. After any meal at Pizz’a Chicago, you can always find satisfaction with a warm Cookieza baked to gooey perfection. Pizza is nothing new to most Americans, but the pizzas we enjoy today are often traced back to flatbreads created in Naples around the 19 th century. However, flatbread creations have been enjoyed since the 6 th century B.C. as you will learn in this video. Pizza in America was not popularized until after WWII, though it was introduced much earlier by Italian immigrants in New York City. Once Americans began to enjoy pizza, it took on many regional forms—including the famous Chicago-style deep dish that comes piled high with toppings, sauce, and mounds of cheese. 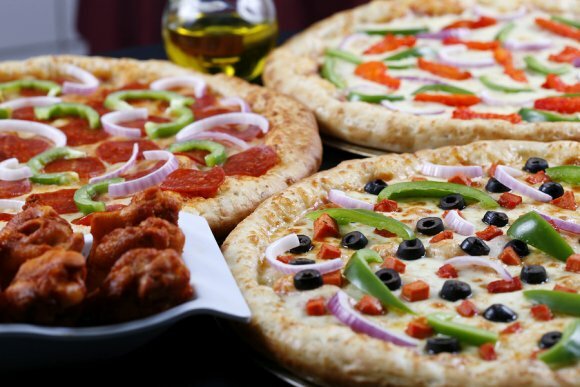 Pizza is not just a favorite in America, though diners in other nations enjoy many toppings that would be considered rather unconventional in the U.S.
Planning an event takes a lot of work, so it’s best to start early to get a jump on all of the arrangements. Whether you are planning a corporate event, a birthday party, or a graduation celebration, you’ll need to make a number of decisions in the months and weeks leading up to the big day. In addition to finding the perfect event space, you’ll have to decide who you want to invite and what your caterer serving Palo Alto will feed your guests. When you are choosing a menu, consider having deep dish pizza that will please everyone’s palate. Gluten-free pizza is a good option to have on hand, and you can choose pizza toppings to satisfy both omnivores and vegetarians. Everyone loves a pizza party, so make that your catering option for your next event. Take a look at this infographic to learn more about planning your event, and then share with your friends and family! Corporate events can be a great way to connect with employees, welcome new clients, or showcase your company’s recent accomplishments or upcoming products. However, these events may involve a little more planning than a regular catered event, because every detail will be a reflection of your company’s image. To make sure that your next corporate event is a success, follow these helpful tips for choosing the right caterer and venue. You should know exactly what you want your event to say and what you want guests to get out of it. For example, a holiday party may do more than provide employees an opportunity to socialize. It should remind staff members of their connection to the company and engage them to improve morale. Events for clients may be intended to show off what your company has to offer, so branding will be particularly important when it comes to décor. Hosting any event in the office might add extra stress, because you will need to worry about the appearance of the whole office, not just the conference room where the event is held. An off-site venue can reduce the stress and ensure that there is no extra work involved with cleanup and party-prep. When it comes to the catered menu, you do not have to go over the top to make guests happy. In fact, the simplest choices like pizza, salad, and Buffalo wings can make your event much more approachable and leave guests feeling satisfied. Plus, these options will take less of a toll on your budget, leaving more room for the important details that can allow the event to meet business objectives. When you host a corporate event in the Bay Area, you will have a plethora of catering and banquet options, but the best bet may to keep it simple with classic foods that everyone will love. There are few things more satisfying than a perfectly crafted pizza served fresh from the oven , but warming up your palate with stuffed mushrooms or pesto cheese bread is never a bad idea. When you dine out for pizza, there are many delectable choices to step up your meal and add a little gourmet flair for the table. Buffalo wings are a classic appetizer before pizza, but those who think outside the box might go for fried calamari or garlic fries instead. If you’re looking to make the meal a little healthier, a fresh, green salad can offer some low-calorie nutrition to help you limit yourself to just one or two slices of pizza. For a salad the whole table can enjoy, an antipasto plate is sure to satisfy with the authentic tastes of Italy in imported meats, marinated veggies, and cheese served over greens. No matter which delectable starters you choose, make sure to save room for the star of the show—the pizza! Even as an adult, you might still have vivid memories of your best childhood birthday parties. If you want to provide your child with the same positive memories, you should start planning birthday celebrations as soon as possible. This video offers some helpful tips for planning the perfect party by selecting the right theme, putting together fun gift bags, and offering food that kids love. Pizza is always a reliable choice, and cake is a must for kids of all ages. Incorporating the party theme as much as possible throughout the food and decorations will make the party truly special and memorable for your child. Hiring a caterer can make event planning much less stressful and ensure that your event is a success, but you may need to do a little bit of legwork to find the right fit with a catering service for your party. 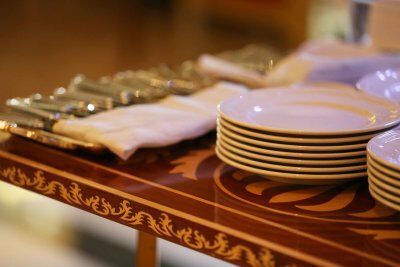 As you begin to browse catering services in Palo Alto , be sure to follow these steps in your catering service selection. Not all caterers will offer setup and cleanup, so you will want to make sure that your caterer offers a full-service experience. You should also ask about the types of service available—table service, buffet-style settings, or something in between. This will let you know exactly what you can expect from your caterer so that you know what you still need to take care of on the day of the event. Even with choices like pizza, you may have some specific requests to make sure that guests with allergies or other dietary restrictions have something to eat. Ask your guests about their needs for gluten-free, vegetarian, or dairy-free options so that you can bring these to your caterer and plan a delicious menu that everyone can enjoy. A great caterer will be happy to take specific requests to meet the dietary needs of your guests. Meeting a caterer in person rather than over the phone will give you a better idea of their customer service and presentation. Plus, you may be able to try samples of food before you book the event so that you can plan out a great menu. The key to hosting a catered event that everyone will remember is planning early and providing your caterer with detailed specifications to make sure everything is perfect. 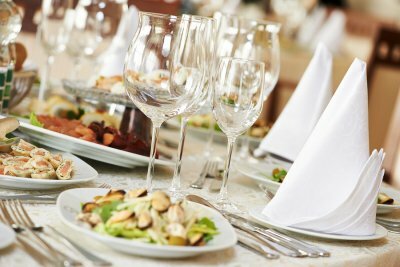 The right caterer will help you determine how much food you need and provide a terrific experience from start to finish. Pizza is now one of the most beloved foods on the planet, but it has not always been held in such high esteem. At its core, pizza is a food intended to be served at informal venues, sold on the streets to feed the masses, but today it can be found in restaurants of all varieties. Until 1940, pizza was actually little-known outside of Naples, but it gained significant popularity in Italy once Queen Margherita dined on the pie now named for her. This article will explore more of pizza’s history so you can see how it went from being known as the food of peasants to being one of the most popular foods in the world. For most people today, pizza must have red sauce, cheese, and a variety of toppings. However, pizza was created as a more humble offering that only had a small selection of toppings—often excluding tomatoes altogether. Pizza began as flatbread, which was topped with whatever was affordable and available. 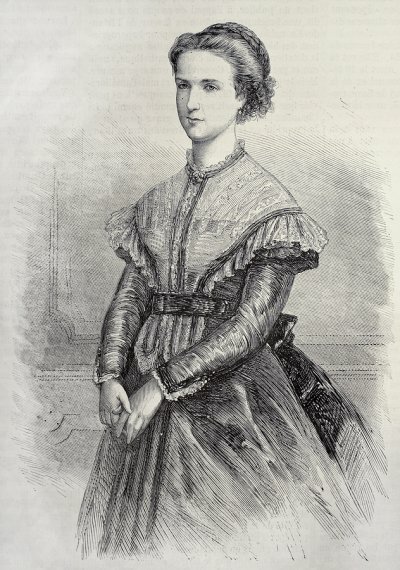 In 1889 King Umberto and Queen Margherita visited Naples, where the queen dined on the local cuisine as a departure from the French haute cuisine she was accustomed to. A variety of pizzas were served to her, but her favorite by far was topped with tomatoes, basil, and fresh mozzarella—each topping representing a section of the Italian flag. From this point, pizza became a staple of Italian cuisine. While Italy embraced pizza as a national dish, it took some time to gain popularity in the United States. Italian immigrants brought pizza to American cities, but it was not until the end of WWII that the food became a staple of American dinner tables. Now each region has its own unique take on pizza, including the iconic thick-crust deep dish famous in Chicago. Now pizza has become so well-traveled that you do not have to fly to Chicago to sink your teeth into deep dish pizza.